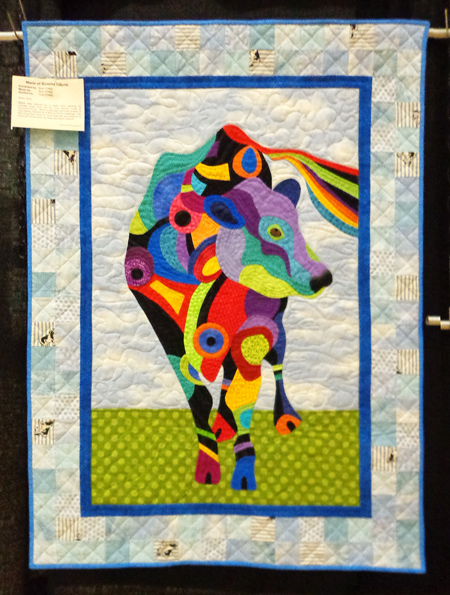 Cathy Perlmutter is my special friend that I visit with whenever I’m in her area for a quilt show. 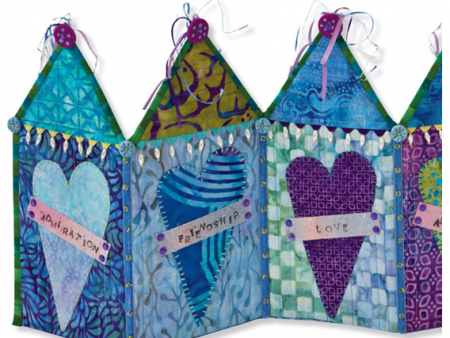 She writes the fabulous blog Gefiltequilt about her wondrously creative projects. When I took a look at this month’s featured book, I knew that it was right up Cathy’s alley. Yay, she agreed to write a guest post!! 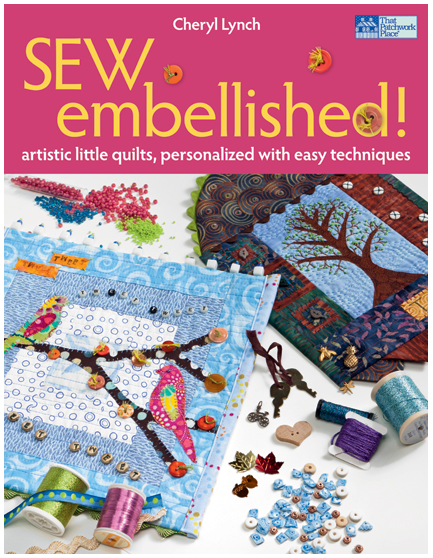 How lucky am I that Kay Mackenzie loaned me a copy of Cheryl Lynch’s new book, Sew Embellished! 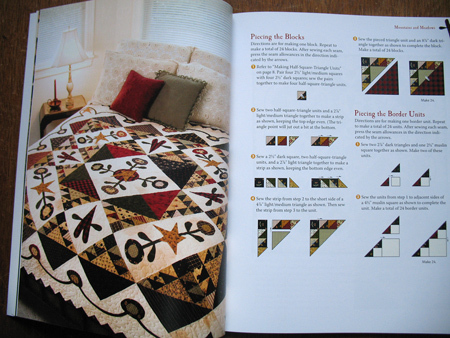 Artistic Little Quilts, Personalized with Easy Techniques, published by Martingale in 2012. This book is a delight, and packed with useful information. For everyone who would like to start embellishing, or be inspired by new ideas, this book is a must-have. The book starts out as an embellishment encyclopedia. Cheryl shows how to attach a wide variety of beads, buttons, and miscellaneous hardware – anything, as she says, that has a hole in it. She shows how she uses trims as whimsical border treatments. There’s an explanation of how to make custom buttons and beads from polymer clay. 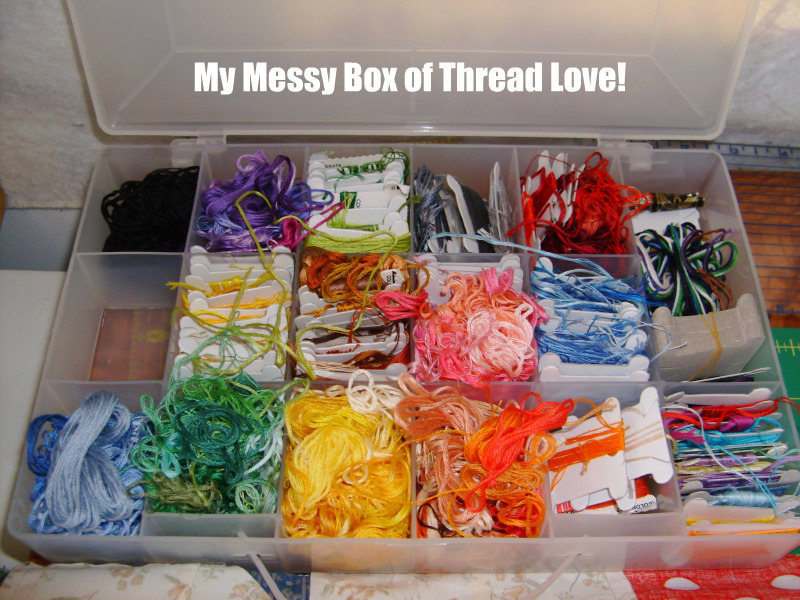 She takes us through a wide variety of threads and yarns, and graphs the main embroidery stitches that quilters need. Cheryl also offers a variety of ways to add words–whether applique, computer printing, embroidery, polymer clay plates, and more. She has a lot of really interesting binding and edging techniques, including folded shapes. All that alone would be worth the price of admission, but we’re not even halfway through the book yet! 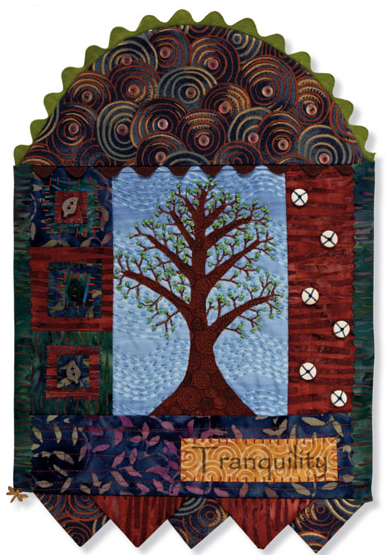 Cheryl’s projects, which involve both piecing and applique, celebrate family, pets, nature and love. She turns unfinished blocks into works of art. My favorite are her brooches with shrink-plastic photos stitched on; a stunning appliqued “tranquility tree”, and her accordion-fold heart & home standing book. 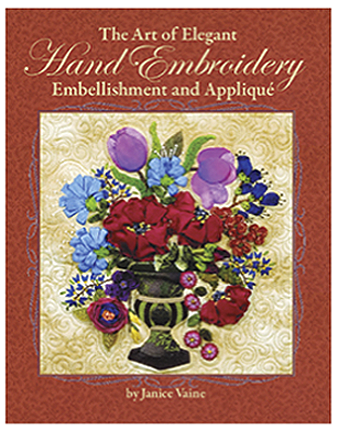 I absolutely recommend this book to anyone who is interested in learning embellishment techniques or acquiring more; and who would like a reference and inspiration for personalized and unique art quilt gifts. I am buying myself a copy. It is a keeper that I will refer to again and again! Kay here… thank you Cathy! Cathy has to get her own copy because we’re giving this one away! If you’d like to enter the drawing, please leave a comment before 7:00 p.m. California time on Monday, April 7. It is with a sorrowful sigh that I must say that these drawings are now open to U.S. mailing addresses only. I found out with a shock that one of the changes in our recent USPS postal rate increase is that the cost to Canada has more than tripled. Apologies to my quilting neighbors to the north. :(. Admin note: the previous drawing for a year’s subscription to the new Quilt Pattern Magazine in still underway. The winner will be chosen the first week of January. Now on to today’s post. Last year at this time I did a special double giveaway to celebrate my birthday on the 17th (not to mention the other holidays). It was so much fun and made me feel like my birthday lasted for a week! So we’re doing it again this year. When the nephews were kids, Dana and I used to travel to Minneapolis for Christmas. Now that the boys are all tall and college-y, we stay home and enjoy the comforts of our own living room at Christmastime. Much as I loved seeing the boys dive through their presents, now I love our quiet celebration at home. And so, in keeping with that theme, I’ve selected two titles that play on the theme of Comfort. 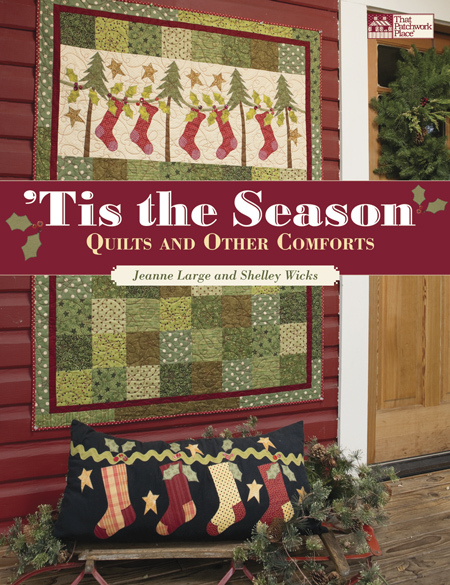 First we have ‘Tis the Season: Quilts and Other Comforts. Jeanne and Shelley should be experts in the field, since they live in Saskatchewan, Canada. 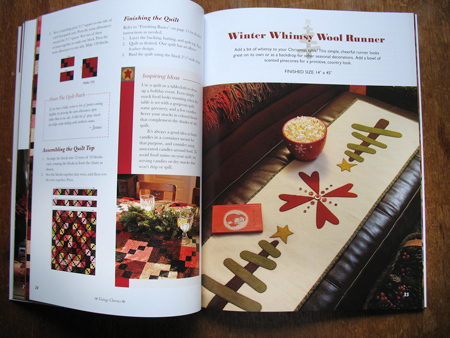 The book starts out with basic information on fabric selection and preparation, then moves on the the authors’ favorite special techniques. Included here are fusible-web appliqué, fusible-interfacing appliqué, working with wool, hand-embroidering, making vines, and finishing basics. Then, on to the projects! 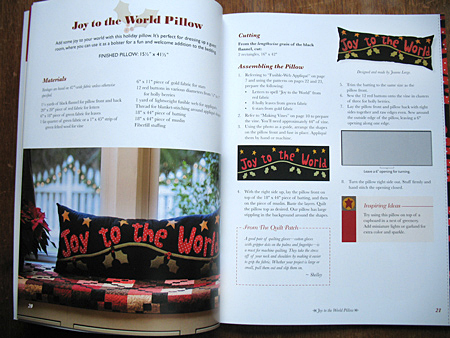 There are detailed instructions for very cute pillows and wall quilts to welcome Santa and the season (you can see one on the cover), cozy lap quilts, cheery welcoming table toppers, a whimsical primitive wool runner, and tons of inspirational decorating ideas. What I really like about these projects is all the words! 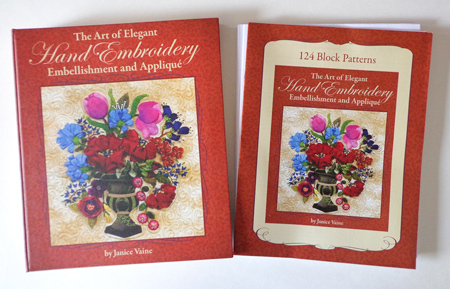 Plus, the templates given in the book are full-size and already reversed for your ease of use in fusible-web appliqué. 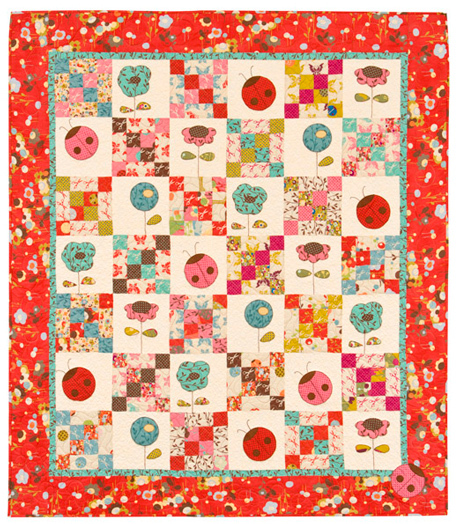 Our second offering is Country Comforts: Quilts for Casual Living. 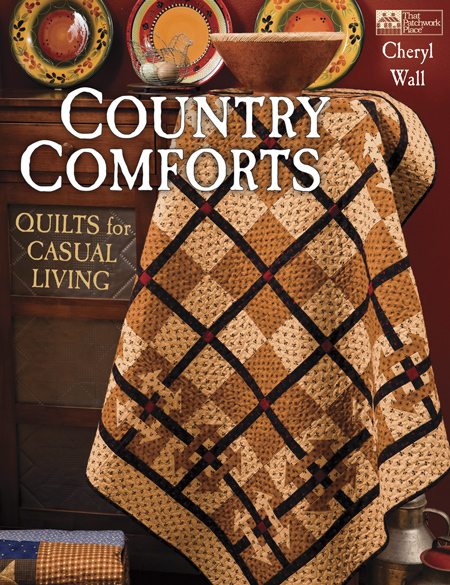 Country Comforts by Cheryl Wall is full of that comfy old-fashioned primitive style that I appreciate so well. The author’s introduction is an inspiration unto itself. 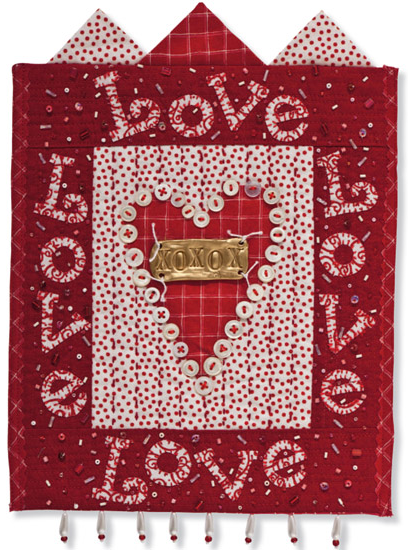 “I’m drawn to the primitive style of quilting and crafting because of the freedom it allows me to make projects that are less than perfect but still beautiful,” says Cheryl. 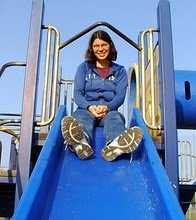 “I believe that the creative process should be fun and soul satisfying.” Right on sister! Worrying about stuff only robs us of the enjoyment of quiltmaking. 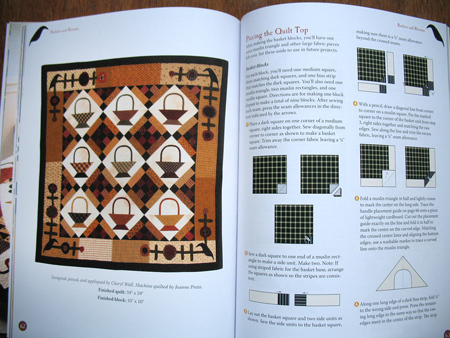 The books starts out with the basics of quiltmaking, including supplies you’ll need and some info on the types of fabrics that work well for this style, also rotary cutting, chain piecing, pressing, freezer-paper-on-top hand appliqué, wool appliqué, and hand-embroidery stitches. Finishing your quilt is covered too. 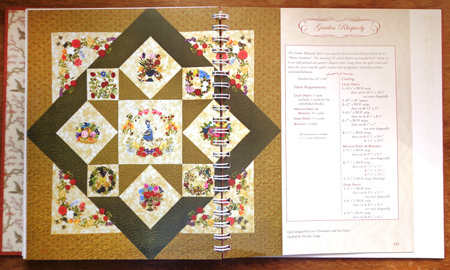 Most of the warm and inviting projects in the book are a combination of patchwork and appliqué, a combo platter that just always works. You’ll find quilts for laps, beds, tables, walls, or just plain draping over something. All of them will lend your home that air of casual comfort and relaxation. If you’d like to enter the drawing to win these two titles courtesy of That Patchwork Place, leave a comment by 7:00 p.m. California time on Saturday, December 18. Those subscribed by email or feed reader, remember that you’re not actually on the blog when you read the posts. You’ll need to click the title of the post to be taken to All About Appliqué on the internet, where you’ll be able to leave a comment at the bottom of the post and enter the drawing. U.S. and Canada only due to the cost of shipping. Good luck everyone and I hope you are having a happy holiday season! I have to say that I’m just a flat appliqué girl myself. But I truly appreciate dimensional appliqué and our book look for August is a fantastic celebration of floral forms that stand up and sing! 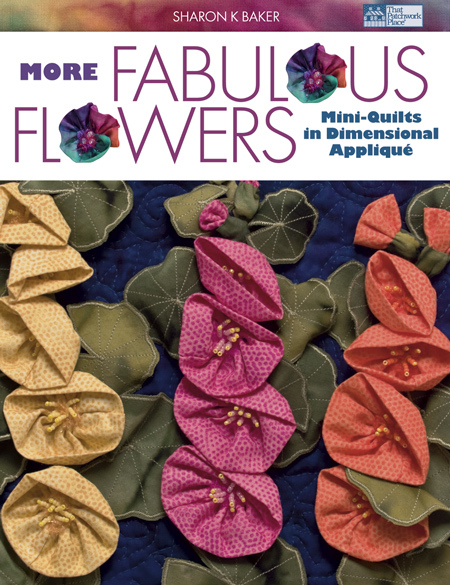 More Fabulous Flowers: Mini-Quilts in Dimensional Appliqué by Sharon K. Baker gives a ton of information on how to make faced, double-fused, prairie-point, double-folded prairie-point, ruched, strip-pieced, and yo-yo leaves and flowers. 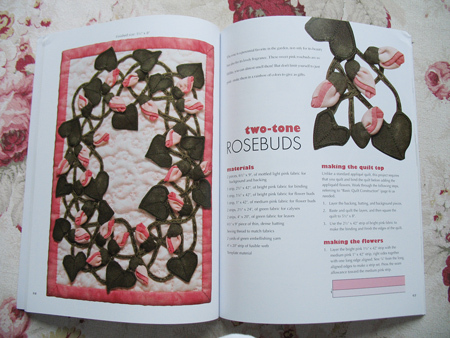 The detailed, illustrated instructions in the book go soup-to-nuts, from fabrics and supplies to pre-quilting the background to making stems to constructing all those luscious leaves and petals to embellishing them with beads and yarns to finishing the darling mini-quilts. Many thanks once again to Martingale & Company / That Patchwork Place for providing a copy of More Fabulous Flowers for a lucky reader. If you’d like a chance to win, leave a comment by 7:00 p.m. California time on Monday, August 9. U.S. and Canada only due to the cost of postage. Those subscribed by email, remember, don’t reply to the email to leave a comment. Instead, click over to the blog itself. The comments link is at the bottom of the post. Tasty precuts make great ingredients for A Baker’s Dozen! 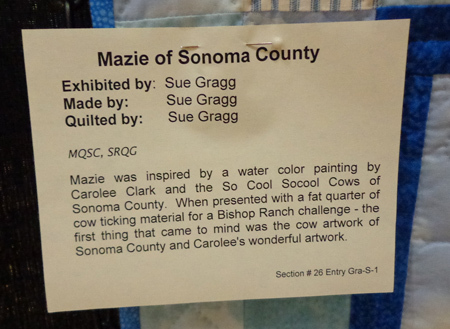 Most of the staff at Martingale & Company (parent company of That Patchwork Place) are quiltmakers. 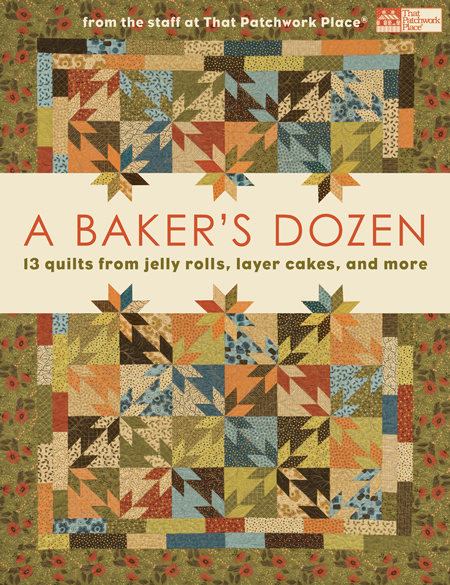 In this collaborative pattern book they challenged themselves to use the yummy precut assortments available today… we’re talking jelly rolls, layer cakes, honey buns, turnovers, dessert rolls, fat quarters, and charm packs… to whip up a bakery case of delectable quilts. Note: It isn’t required to use precuts. Each set of instructions also gives fabric requirements for pulling from your stash or from bolts at the quilt shop. 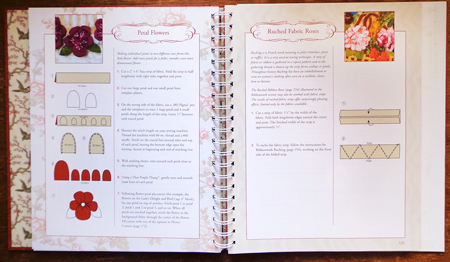 But just in case you have been tempted by those luscious jelly rolls, layer cakes, etc., the book gives information on how to handle them, sort them, to wash or not to wash, and what to do about those confusing pinked edges. Staff from all areas of Martingale contributed to the book, from web manager to the marketing department to customer service and relations, print and production, editorial, book design, illustration, accounting, author liaison, acquisitions and development, and the social networking coordinator, who quilted 11 of the quilts! I thought it would be fun to hear something about the process. Mary Burns, Marketing Coordinator, tells the story of her quilt Flying Shuttles. The Editorial Department put out a call to the staff for designs using precut fabrics or fat quarters. I don’t really consider myself a quilt designer. I think of myself as just your average quilter. Everyone here is so encouraging though—I work with such wonderful and creative people—so I decided to jump in! I had a fat quarter pack of Kim Diehl’s “Country Haven” and I knew I wanted to do something old-fashioned and folksy to go with the décor of my 1901 farmhouse. 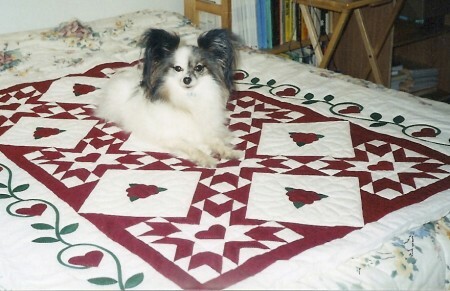 I found a traditional pieced block called “Cracker” in my trusty Judy Hopkins book 501 Rotary-Cut Quilt Blocks. I set the blocks in circles and called it Colvin Mill Wheels, after a historic mill near my sister’s house in Virginia. At the last minute, I sketched out an alternate layout of Cracker blocks in vertical rows—and that’s the one that was chosen. (Hooray for last minute inspiration!) At that point the quilt didn’t have any appliqué, but after I pieced it and sewed on the cream border, it just looked like it needed something. I sketched out a flowing vine, some leaves, and folksy flowers. Fortunately, they were thrilled—but I only had a couple weeks before the deadline for finished quilts— and I was scheduled to be at Spring Quilt Market the first week and on vacation at my sister’s in Virginia the second week. What was I thinking?! As Marketing Coordinator, one aspect of my job is to get everything ready for our booth at Quilt Market. 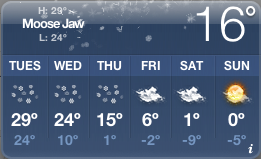 The month up to and including Market is extremely hectic. I stayed up late every night the week before we left, finishing the pieced borders and machine appliquéing all my vines and leaves, cutting out all my folksy flowers and flower centers and packing them all in my carry-on—didn’t want to risk losing it! I use freezer paper applique on the wrong side of the fabric, with the shiny side up so that I can press the seam allowance to the sticky side, then cut a slit in the back and remove the paper. I machine-appliqued the vines and leaves and hand-appliqued the flowers and flower centers. I finished appliquéing the centers onto the flowers on the plane; it really made time fly! When we got to the hotel, I laid the quilt out on my bed and figured out where I wanted the flowers to go. Despite my valiant efforts, by the time Market was over, I still wasn’t finished appliquéing the flowers—how naïve of me to think that I could work hard at Market and still have time and energy to finish the quilt! So off to my sister’s house the two of us went, my quilt and I, with a promise that I’d email a photo of the finished quilt before the deadline. It’s kind of fitting that I finished it in all the way across the country in Virginia, near the Mill that originally inspired me to use the Cracker block. I changed the title of the quilt to “Flying Shuttles” because the way the Cracker block turns left and right reminds me of how a shuttle flies through a loom. When I showed it to my teenage sons at home, the Cracker blocks reminded them of the old Intellivision game, Astrosmash, and the space shuttles that you had to shoot to win. 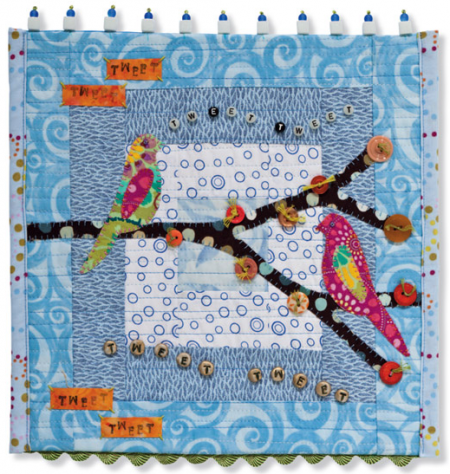 Either way, I just love how this quilt turned out–and apparently I’m not the only one, because the quilt has been chosen to be in That Patchwork Place Quilt Calendar 2011—I’m Miss November! So there’s my saga, hope you find it amusing. The hardest part about designing a quilt pattern is that you have to write down everything you do, and have it make sense to someone who’s never done it before. Now I know! It’s not as easy as it sounds! Cathy Reitan, Martingale’s author liaison, set a personal challenge for herself with her design. I have always created with textiles, starting in high school with fashion sewing from patterns and then moving into copying store fashions. As I moved into my 30s and had a family, the focus changed to children’s designs and home dec sewing with a little bit of quilting. 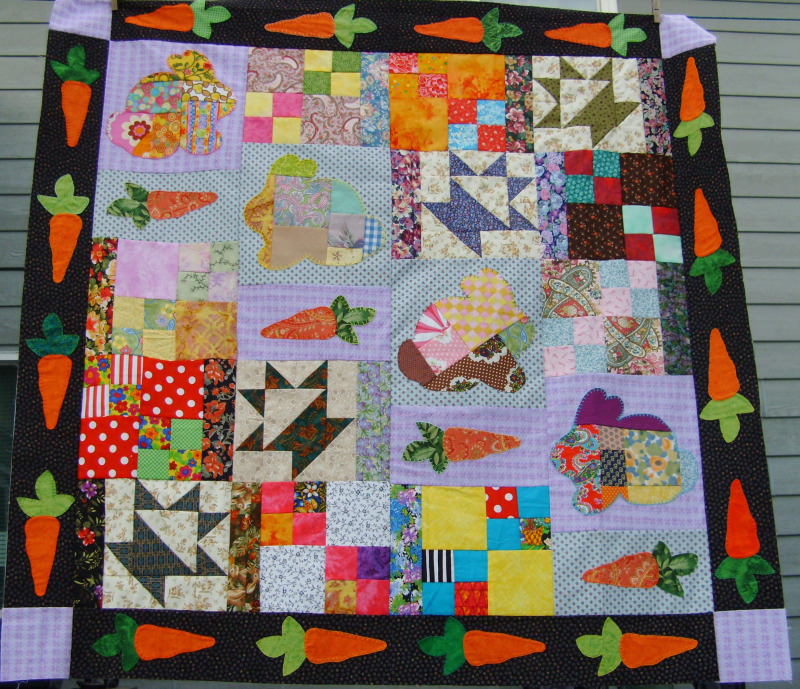 With the dawn of children having their driver’s licenses and freedom from being a slave to the car, I began to quilt. You know, the kind of quilting where you plan a project, shop for the items you need, and work on it for significant lengths of time, not just in stolen moments. I usually use traditional civil war colors and patterns with a lot of hand work. When the opportunity to design a quilt for A Baker’s Dozen came along, I set myself a goal of using colors out of my normal color palette and geometrical shapes that where also not the norm for me. Circles and Chains was the result. I combined the traditional Irish chain block ( just could not completely give up the traditional) with the geometric fast-fused applique circles. I made couple of sample blocks and threw them away because the colors I picked were not strong enough to support the jelly roll I wanted to work with. Back to the quilt store for the brown and yellow solids and another trial block was made. The effect of the deeper color was much better with my jelly roll. I used several colors I love to hate, primarily orange paired with turquoise which is color that I am repeatedly drawn to but matches nothing in my house. Now I just need a child to give up a bedroom so I can decorate with a new color scheme! Working at Martingale is a great place to inspire creativity and take the next leap of faith because there is always someone to encourage and praise your efforts. There is always someone to bounce and brainstorm ideas with. Of course with so many beautiful samples coming in from authors the list of projects I want to make is always longer than the hours left in my lifetime! Adrienne Smitke from the illustration department describes the collaborative effort that went into her design. This quilt was a team effort, and I think that’s part of why I like it so much. 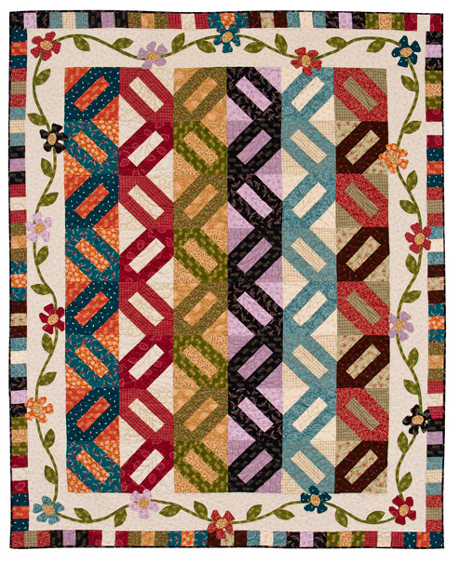 Not only are the colors and motifs cheerful and welcoming, when I see this quilt I think about all the different elements of its construction and how many different hands helped stitch it together. While I really like sewing, I love shopping for fabric. I could spend hours browsing either online or in the fabric store through the ever changing rows of color and pattern. It is more often the fabric that helps inspire the kind of quilt or project I want to make rather than the other way around. I had been trying to come up with an excuse to work with Momo’s Wonderland fabric line since its release. 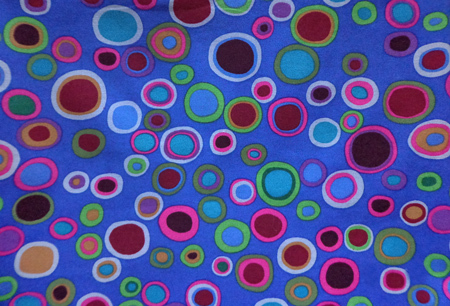 While browsing for ideas, I took a closer look at the polka-dot print in this fabric line and discovered that some of the dots were actually ladybugs. Inspiration struck and I knew ladybugs would make a cute and easy appliqué design. 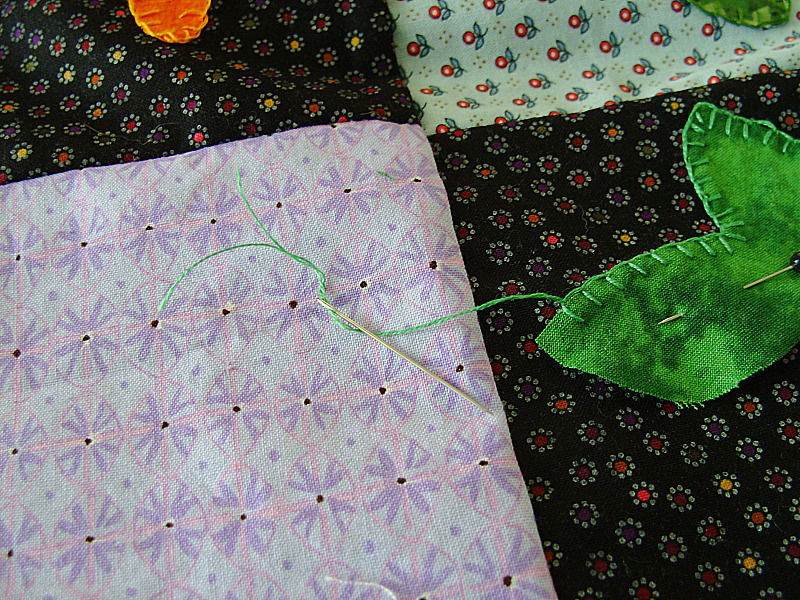 To compliment the ladybugs, I pulled three simple flower shapes from the print used in the border. As a technical illustrator I spend a lot of time working with Adobe Illustrator (a vector drawing program), so it was easy for me to draw the full size applique patterns on the computer. This allowed me to easily tweak and size them as I needed to fit the blocks. You don’t need to be a professional designer to use a computer to create your own patterns. Many computers already come with drawing software, or you can simply Google “vector drawing program” online to explore the many options available. It can take a little time to get used to the drawing tools in these programs, however you shouldn’t be discouraged. Like with any skill, practice makes perfect. Once the quilt design was complete, that’s when the teamwork began. I knew I wouldn’t be able to finish two complete quilts (my other quilt in the book is “Rose Garden,” page 62) in the time available, but my co-workers came to the rescue. Despite that they were all working on additional quilts of their own for A Baker’s Dozen, they pitched in and each took on a part of the process. 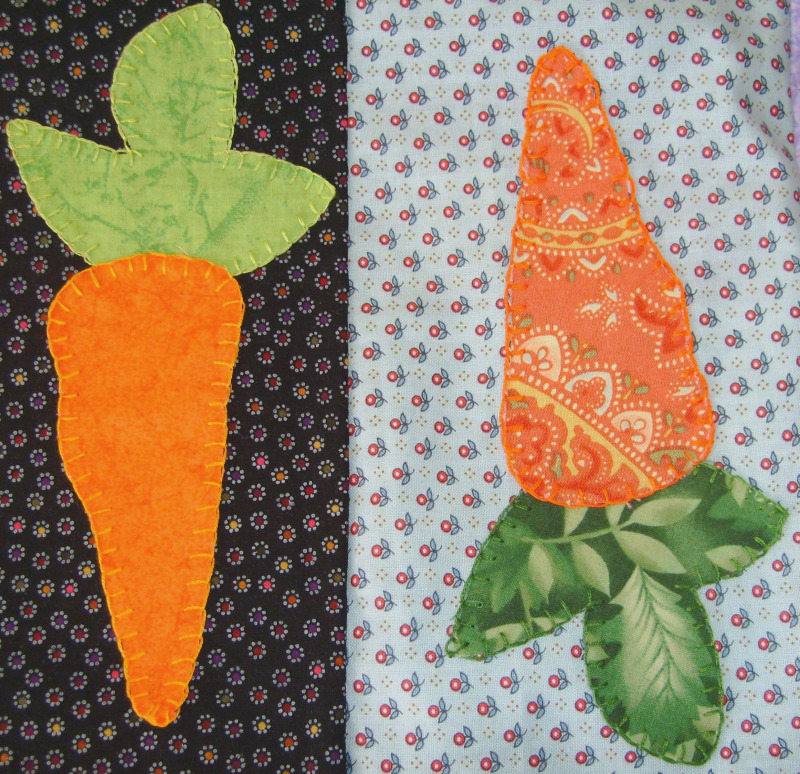 While I cut and sewed the pieced blocks, Karen Soltys worked on the appliqué blocks. 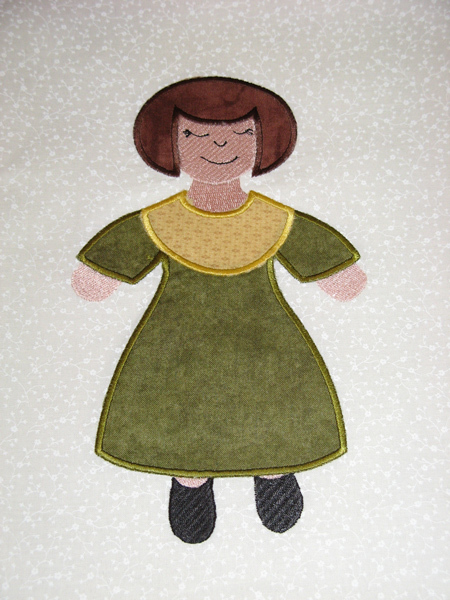 Karen has a wealth of great tips for how she made the machine appliqué simple and easy. First she traced all the large shapes on fusible web and then, before cutting any of them out, traced the smaller shapes inside the larger ones. She cut those smaller pieces out of the centers of the larger ones, and fused them onto their contrast fabrics. This not only saved on fusible web, but made the finished appliqué blocks much softer and more flexible. 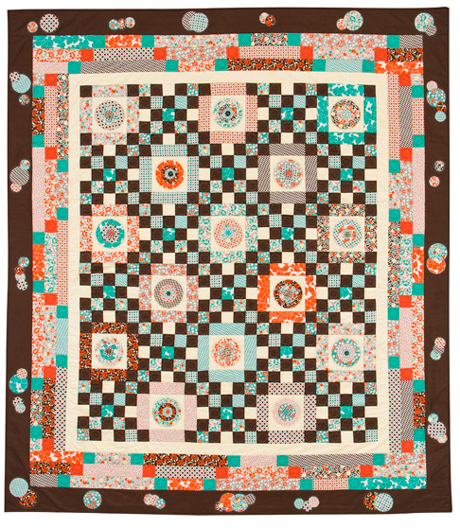 After all the shapes were fused to their fabrics and then to the white background blocks, Karen machine-blanket-stitched around all of the shapes using chocolate brown machine-quilting thread to add definition to the designs. 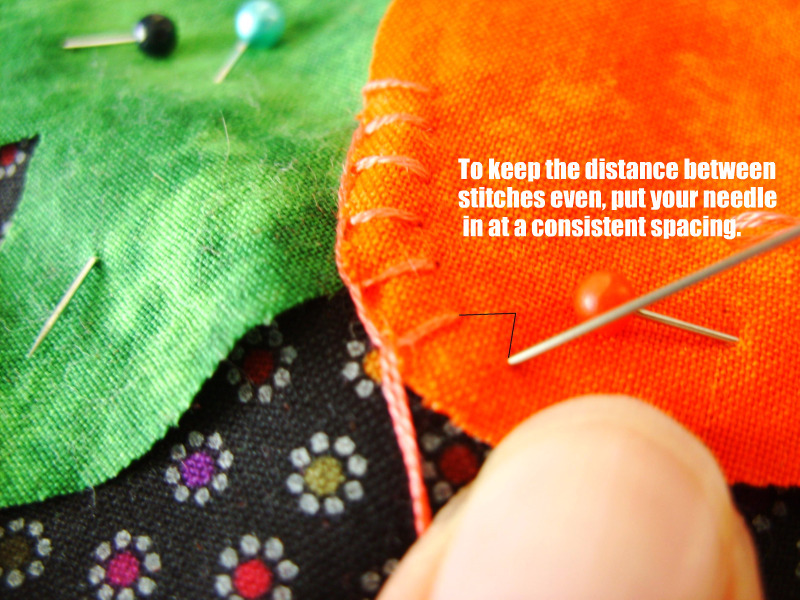 She recommends using open-toe presser foot so that you can easily see where you’re stitching. In addition, she used a 50-weight thread (“regular” sewing thread) in the bobbin, which required loosening the machine tension a bit so that the bottom thread wouldn’t pull up to the top as she stitched. Karen handed off the appliquéd blocks to Cathy Reitan, who hand-embroidered the beautiful details for the flower stems, lady bug wings, and antennae before assembling the blocks and borders into a quilt top. 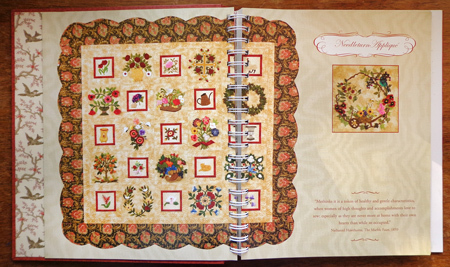 Karen Burns, who did the stunning machine quilting on almost all of the quilts in the book, stitched all-over swirls in the appliqué blocks to help the motifs stand out, and then added flowers in the borders reminiscent of the flowers in the fabric pattern. 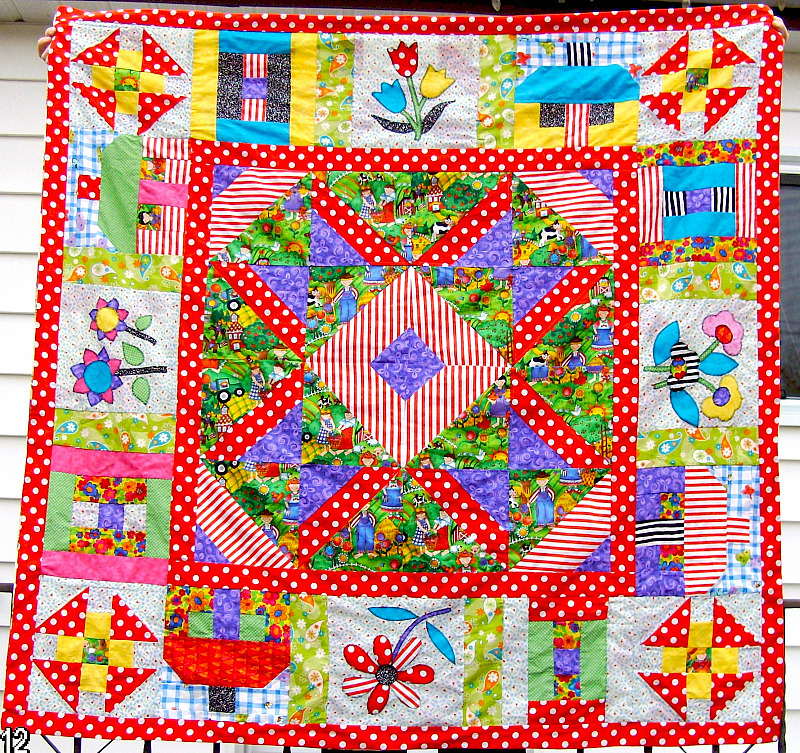 Finally the quilt came back to Cathy, who sewed on the binding and hanging sleeve. It was really thrilling to see how all of the blocks and pieces were assembled into a stunning final product, and to know each of us had a hand in it. Now the quilt hangs behind my desk at work and each day I am greeted by its cheerful motifs and reminded of the teamwork that helped put this quilt together. Now I hope that tracks for most of you. I have only a vague understanding of computerized machine embroidery, enough to be mighty impressed by those who do it. Before I knew it, Emily was back in my in-box with Violet, all done! Wow! Who knew? The legs, shoes, hands, feet, and face are all machine embroidered, and I think the edges of the dress too? That is just so very cool! Thank you Cousin Emily!